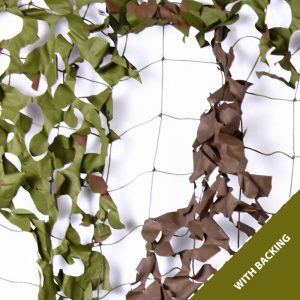 Custom Size Camo Net by the metre gives you the exact size you need for any project. Our custom-cut nets are available in all colours from woodland to black or white. Our netting is durable and easy to join with cable ties, and is suitable for all purposes. We supply customised woodland net in large sizes to mimic natural habitats in zoos and wildlife parks. But the intense leaf coverage and flexible construction is also ideal for smaller-scale nets to reduce glare on camera lenses, conceal fishing rods and hide hunters and birdwatchers. Our custom-cut camo net in white, red and blue is fun and hardwearing for outdoor adventure playgrounds and indoor play areas. Festival organisers choose Camonets’ tailored netting to conceal and protect equipment on-stage and create flexible barriers, weather proofing and shade for campsites. And film and TV companies rely on customisable nets on location and in the studio to keep costs down and cover movies and productions from start to finish. Made-to-measure camouflage netting is not a new idea. During WWII enormous camo nets were deployed to disguise everything from entire airports to key munitions factories. And snipers wreaked havoc using small-scale, foliage covered net to conceal themselves, their weapons and cut down tell-tale reflections on rifle sights. 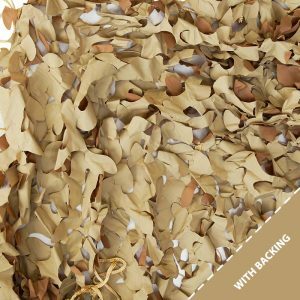 So whether you want to hide or safeguard today, customised camouflage has a proven history of success. Go meet the monkeys and primates at ZSL London Zoo and you can see Camonets’ made-to-measure netting integrated into the design of their award-winning enclosures. 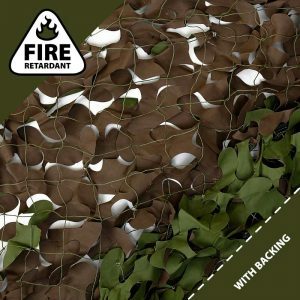 Our non-toxic and eco-friendly woodland netting helps to simulate an organic habitat for climbing and playing. It also provides low-maintenance, year round foliage allowing visitors to observe animals unobtrusively in their natural environment.